Prophetic and profoundly disturbing, Cat Country is Lao She’s dark speculative satire about one man’s experience with a species of cat-people living on Mars. While on the surface, the story is about the wholesale corruption of Cat society (social, political, moral, economic); on another level, it harshly criticizes pre-World War II Chinese society with what Lao She saw as its blind adulation of all things “foreign,” its anemic education system, and its utterly corrupt government. When the unnamed narrator crash-lands on Mars and finds that his two companions are dead, he is quickly picked up by some Cat people and harshly restrained. Escaping from his bonds, the narrator encounters the politically-powerful Scorpion (and later, his son, the jaded and critical Young Scorpion) and learns about Feline ways: how the social, political, and economic foundations of Cat society have eroded until only the most basic instincts remain. The only thing that Cat people care about any more are “reverie leaves” (read opium) which, when eaten, make the cats languorous and dull. All conflicts erupt over these leaves, which have become so central to the Cat diet that they are substitutes for food. Eventually, the narrator encounters the critical Young Scorpion, who details the emptiness of the educational system, where cats graduate on their first day of school and then call themselves “scholars.” In an eerie foreshadowing of the Cultural Revolution of the 1960s, Young Scorpion describes how students and teachers turn against one another, with students attacking and killing their teachers while the teachers neglect to instill any kind of integrity or basic knowledge in their students. Ultimately, the narrator’s sojourn on Mars coincides with the last gasp of Cat society, which collapses in front of his eyes. Invaders from another part of Mars obliterate the Cat people, who have spent centuries dumbing themselves down and cultivating greed, pettiness, suspicion, and lassitude in their children. Lao She uses this story of another species on another planet to critique the China of the 1920s and 1930s, where She saw that foreign ideas were snapped up without thought and education became more about titles and bombast than real knowledge. 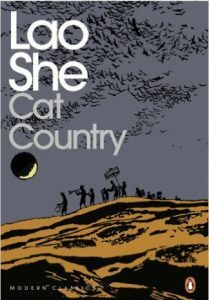 Like Brave New World, also published in 1932, Cat Country is a scathing satire and dystopian view of the writer’s world, and a warning for the future.